Testimonial: Epoxy and Adhesive Fume Control - Bulow Biotech Prosthetics - Sentry Air Systems, Inc.
Bulow Biotech Prosthetics provides custom, functional and cosmetic prostheses to individuals who have suffered an amputation of an extremity. They use epoxies and adhesives to fabricate prostheses and were seeking a quick solution for removing fumes from the workplace. Because the company was familiar with ducted systems and unsure of the effectiveness of ductless systems, Sentry Air representative McKay Hansen offered them a demonstration unit. The results of that demonstration are relayed in the comments below. “I have worked with most chemicals commonly used within the prosthetic industry and have used the typical ventilation systems that are common in our industry. 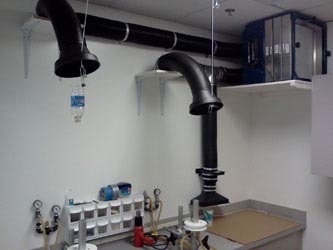 The ventilation systems commonly used involve overhead hoods and require custom made duct work that is fixed in position at a work station. These systems are very expensive and often inadequate because the ventilation is usually not close enough to the source. Our current location is in a professional, medical office building and the most inexpensive quote for a ventilation system was $23,000. The Model #SS-400-FSD Floor Sentry Double is a dual arm fume extractor that provides source-capture fume extraction to two work stations simultaneously. It features powerful suction and a dual-stage filtration chamber consisting of a Carbon Pre-filter and a 22 lb. Activated Carbon Filter. This fume control solution also includes heavy-duty casters for easy mobility, self-supportive flex arms that are capable of 360-degree rotation, and an infinitely-adjustable variable speed controller. Sentry Air offers several additional configuration options for chemical fume control, including wall-mounted, floor, and benchtop models. For information on ductless fume removal options for your workplace, give us a call at 1.800.799.4609, email us at sales@sentryair.com, or fill out this online form to have a Sentry Air Systems Applications Specialist contact you to discuss your process.